NFL player is expected to surrender in court Thursday; bail expected to be $200,000. If convicted, Stallworth could face up to 15 years in prison. 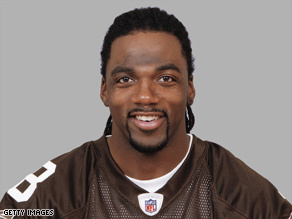 (CNN) -- Cleveland Browns wide receiver Donte Stallworth was charged in Florida on Wednesday with killing a pedestrian while driving under the influence, a spokesman for the Miami-Dade County state attorney's office said. Authorities charged Stallworth, 28, with DUI manslaughter in the death of Mario Reyes, spokesman Ed Griffith said. Stallworth is expected to surrender in court Thursday, Griffith said. The charge is a bondable offense, and bail is expected to be set at $200,000. According to Griffith, Stallworth's blood-alcohol level after last month's accident was measured at 0.126 percent, higher than the state's legal limit of 0.08 percent. Stallworth was drinking at a Miami Beach, Florida, club early March 14, court documents say. He later left the club and went to a Miami residence for about 45 minutes before leaving in his black Bentley GT at 7:07 a.m. He was driving east on the MacArthur Causeway, which connects Miami to the South Beach area of Miami Beach, when he struck Reyes, prosecutors said. Reyes, a construction worker, was crossing the eastbound lanes of the causeway. CNN affiliate WSVN reported that he was heading to a bus stop after leaving work. Stallworth told the arriving officer, "I hit the man lying in the road," the affidavit said. He said he had time to honk his horn and flash his headlights to alert Reyes, according to the documents. Police smelled alcohol on his breath, the documents said, and Stallworth provided a blood sample at the scene. Stallworth released a statement four days after the incident saying he and his family were "grief-stricken." "My thoughts and prayers are with the Reyes family during this incredibly difficult time," he said. Among the expected conditions of Stallworth's bail are that he consume no alcohol or drugs, submit to random drug and alcohol testing, abide by a curfew between midnight and 6 a.m., surrender his passport and not drive, according to an agreement setting conditions of his release. He will be allowed to reside in Ohio and Florida as needed, but he must notify authorities 24 hours in advance when traveling. Stallworth and his attorney have been cooperating with authorities, Officer Deborah Doty, spokeswoman for Miami Beach police, said Wednesday. Stallworth, a former University of Tennessee player, has also played professionally for the New England Patriots, the New Orleans Saints and the Philadelphia Eagles.